Though sodium is an essential nutrient, we only need a small amount to stay healthy. Get the facts on sodium and find out how to lower your intake. Sodium is a mineral that is found in natural foods such as meats, nuts, grains and dairy products. However, we also consume sodium by adding table salt (sodium chloride) to our foods, as well as by eating processed foods that are high in salt content. Too much sodium leads to high blood pressure, which is a major risk factor in heart disease, kidney disease and stroke. Furthermore, high sodium intake has been linked to an increased risk of asthma, osteoporosis and gastro-esophageal cancer. Populations that consume low-salt diets do not see the same increase in blood pressure with age that is seen in most Western countries. Fortunately, when salt intake is reduced, blood pressure generally decreases within just a few weeks. It might be easy for you to stop salting your food, but table salt isn’t the only place you’ll find sodium. A number of processed foods contain high amounts of sodium as well, including frozen meals, smoked and cured meats (like sausage, salami, deli meats and hotdogs), canned vegetables, olives, pickles, processed cereals, soups, sauces and condiments. Of course, snacks such as potato chips, pretzels and cheese puffs are also high in salt content. It’s said that over 75 percent of the sodium we consume is through processed and packaged foods. 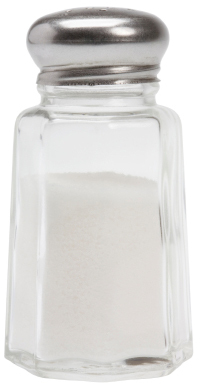 According to Health Canada, the average Canadian consumes around 3,400 milligrams of sodium daily. That’s more than double the recommended amount (1,000 to 1,500 milligrams daily). Just because you see a product that claims “reduced” or “low” sodium or salt doesn’t mean it’s good for you. Read the label and see exactly how much sodium each item contains. Pay attention to serving size when determining your daily sodium consumption. The federal, provincial and territorial governments in Canada are providing guidance to the food industry to safely reduce the quantity of sodium in processed foods. Plus, they are working to increase education and public awareness about sodium issues, with a goal of reducing the average sodium intake of Canadians to no more than 2,300 milligrams daily by 2016. 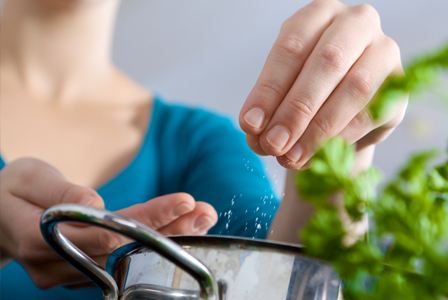 Make an effort to reduce your sodium intake with these helpful tips. Add flavour to your foods with herbs and spices rather than salt. Eat more whole foods rather than processed foods. Read labels diligently and choose products low in sodium. Avoid fast food altogether, or order small/child-size portions. Keep a log of your sodium intake on a daily basis.